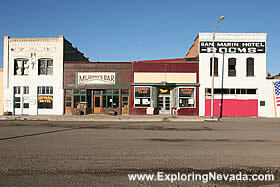 Located on Interstate 80 in Northeast Nevada, Wells is a very busy place due to the vast amounts of travelers who stop over in Wells for gas and other services. Wells also has a superb location. Several outstanding scenic drives begin just outside of town, including the Angel Lake Scenic Drive and the Clover Valley Scenic Drive. Below are the varoius hotels in Wells that are available for online booking. It should be noted that Elko, located fifty miles to the west on Interstate 80, has many more lodging options (Elko Hotel Listings).